The Mark Wahlberg Workout is filled with supersets to get him in shape for his movies. He had to lift very heavy to gain 40 pounds of muscle in 7 weeks. For Pain & Gain, he used a 3 day workout split. Mark’s diet consists of eating all day long. He says he ate 10-12 times a day to gain weight for Pain & Gain. I was 165 pounds for my last movie, but I had to walk on the set at 205. So, that’s 40 pounds of muscle in 7 weeks. That’s a lot of physical preparation. The Mark Wahlberg workout is a 5-day routine. He takes Wednesdays and Sundays off. Mark Wahlberg admits that he made most of this workout up himself. He relied on past supersets that did the job. The workout is all about lifting really heavy to gain body weight fast. 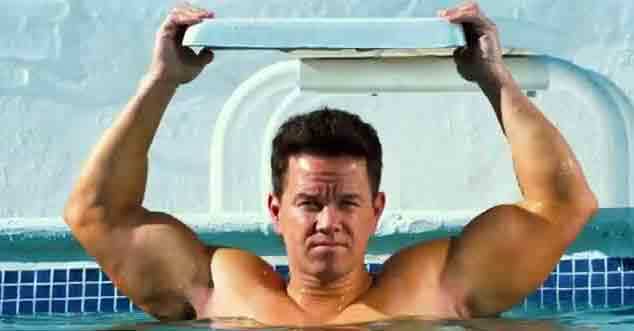 The Mark Wahlberg workout listed below is for Pain and Gain, where he plays Daniel Lugo. In the movie, he gets mixed up in an extortion attempt that goes wrong. Based on a visceral true story, the movie included The Rock, who worked out hard himself, and also has a killer workout routine. 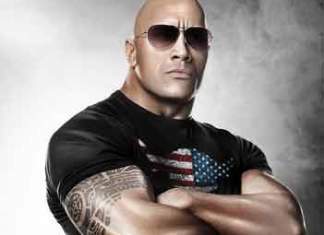 Here is the Dwayne Johnson aka “The Rock” workout. The Mark Wahlberg workout starts his Monday routine very early in the morning, with a heavy workout. Then, he often takes a “growth nap,” before doing an abs workout and light cardio in the afternoon. When actually filming, Wahlberg had to do the entire workout at 4 in the morning. Wahlberg says that he got up to benching 335 lbs. (152 kg) on this chest workout. Do 4 sets of 8-12 reps. The Pain & Gain workout used heavy lifting, and supersets. If you can do more than 12 reps, increase weight to stay challenged. Supersets are done when you perform 2 exercises in a row without stopping. Usually, the first exercise is a compound lift that works multiple muscle groups. While, the 2nd lift is more isolated. For example, Wahlberg would do incline bench to work his chest and arms. Then, he would do shoulder raises to concentrate on just his shoulders. Whatever it is, you got to ease into it. Don’t try to do it all in a day. You’ve gotta work up to it. If you do it right, do the work and get a lot of rest. And, especially get enough nutrition on top of it. You’ll be surprised what you can accomplish with the goals you set for yourself. Mark Wahlberg uses the afternoons to recover, do light workouts, stretch, and do cardio. I go in there and warm up. You know, at my age, I can be injury prone. I stretch, I use the foam roller, use the bands, the Val Slides, stuff like that. I want to remain injury free. The Mark Wahlberg workout starts his Tuesday routine around 4:30 in the morning. He starts with a heavy Legs and Back workout. Then, he often takes a “growth nap,” before doing an abs workout and light cardio in the afternoon. When actually filming, Wahlberg had to do the entire workout at 4 in the morning. Do 4 sets of 8-12 reps. The Mark Wahlberg workout used heavy lifting, and supersets to get the job done. If you can do more than 12 reps, increase weight to stay challenged. Supersets are done when you perform 2 exercises in a row without stopping. Usually, the first exercise is a compound lift that works multiple muscle groups. While, the 2nd lift is more isolated. Mark Wahlberg uses supersets to maximize his results, and keep a high intensity throughout his workout. I’d wake up at 4:30 every morning, have a pre-workout igniter, and then hit the weights heavy, depending on the day and the routine for the day. But it always involved heavy lifting, and mostly just weights. Mark Wahlberg does a lot of biceps curl variations. His workout starts with 10 reps, then goes to 8 reps, then 6 reps. He tried to add weight each time, making this the opposite of a drop set. Mark would also work with the TRX system in the afternoons. Jump squats, split squats, I do a lot of front loaded squats, also a lot of lunges. I’ll tell you what. Do 30 seconds on the TRX, get bands, elevate with one leg in the air, then try to do a jump squat and lunge for 30 seconds straight. Intense squats and lunges. Next, See Mark’s Wednesday Routine. 40lbs in 2 months? Got to love them steroids. I think his hairline would like to have a word with you. You don’t have a full head of hair in your 40’s by doing steroids your whole life. Chris, steroids do not cause hair loss if you’re not already predisposed, it is hereditary. Granted if you are going to go bald, it will hasten the process. 40 pounds of muscle, especially on an already well formed body, would take years. Of course he is on steroids or something along the same lines… Personally I don’t know what it matters. If someone wants to take a PED, go for it. Yes, I wasn’t on board at first. But, I agree with you guys now: You can take PED’s and still have a full head of hair. The side effects are different for everyone. Hey, I was wondering how accurate the information on this article is? 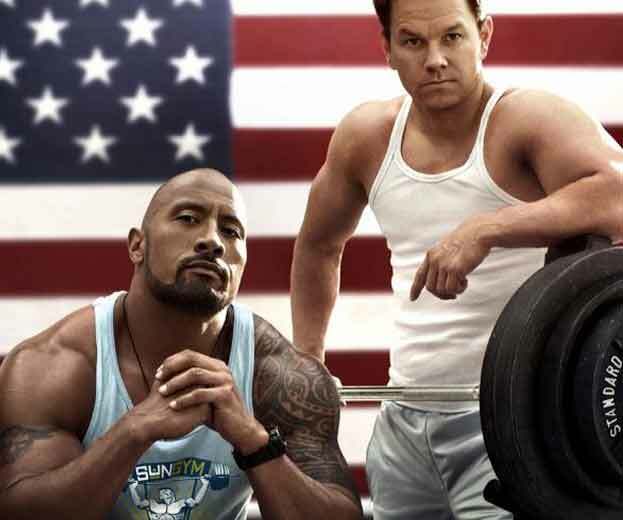 It’s based on all the interviews and magazine articles that Mark Wahlberg did for Pain & Gain. Sometimes, the magazines use an abridged workout to cater to low-patience audience. So, there may be more exercises that Mark Wahlberg did. Still, all the ones he mentioned are in the workout. Also, Mark Wahlberg says that he normally stays in shape by playing basketball a lot. (He has an indoor basketball court in his home). 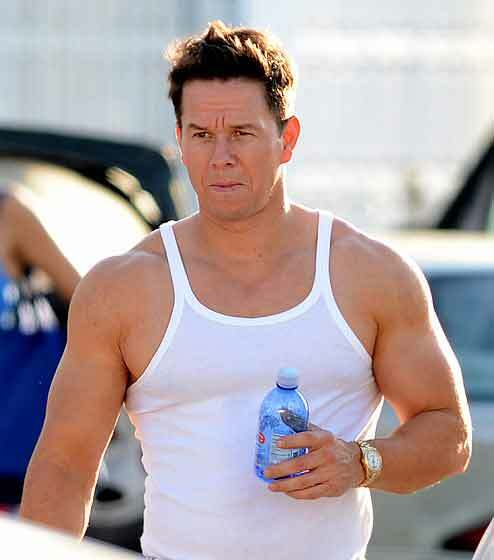 But, for Pain & Gain, Wahlberg was mass building, so he stopped playing basketball to get in shape for the role. hi chris!… so marc trains early in the mornig on an empty stomach, and after workout has breakfast?! But when Mark wants to burn fat, he does cardio first thing on an empty stomach. He plays basketball at his house at 5:30 in the morning. The key to burning fat and losing weight is training first thing in the morning on an empty stomach. Our bodies are conditioned to hold onto fat the best they can. But, at night the body burns fat for fuel. So, when you wake up in the morning, your body has more fatty acids ready to be burned off. Working out later in the day, you’re less likely to burn these fatty acids, and more likely to burn the food you’ve ate that day. So, working out first thing in the morning, on an empty stomach, is what the majority of celebrity trainers do to get their clients to lose weight. It is obvious the author has no knowledge of (AAS). Jay Cutler, Kai Greene and many more professional body builders juice to the gills and do not experience acne, hair loss, nor do they experience gyno. When it comes down to how steroids effect an individual it is all genetic. But you’re right, the effects for an individual will be based on genetics, so despite all these risks, each individual will have a different array of the side affects listed above. With the intensity of these workouts, would doing the muscle groups twice a week be considered over training? The Mark Wahlberg workout focuses on eating a ton of food to recover from his training. By eating all day long (and taking naps he says), Mark Wahlberg was able to recover faster than normal. In turn, he was able to train muscle groups twice per week with great results. Wahlberg had a small window, within which he had to put on weight, so he turned to training muscle groups twice per week. Doing this results in bigger gains in shorter time. But it should also be added that Mark Wahlberg has weight trained for over 20 years. Someone much newer to weight training would surely want to start with only one training session per muscle group. From there, you would have to assess your diet/recovery to decide when to jump to the 2x/week schedule. That’s really what it comes down to. Go back to his Calvin Klein ads waaay back in the day. He’s always been in great shape. It’s much easier for him to do what he did than for somebody who has never worked out a day in their life. It’s easier just to say “I gained 40lbs of muscle” than it is to say “I gained 40lbs”. Sounds cooler, too. There’s no way he gained that much muscle in that period of time. If he did, forget movies… write a book and become a billionaire. Well, he did start a supplement line, “Marked Nutrition.” But yea, I hear what you’re saying. Great info man, but you mention ‘Mark Wahlberg’ in literally every sentence. It seems like keyword stuffing to get your SEO right for Google, but these days Google penalizes this amount of keyword stuffing. Just giving you a heads up. The info is awesome though! Thanks for the feedback. I’ll take a look at that. Awesome article….. Having bulked up effectively more than a few times myself I would say it is the MOST effective way of training for size.. But 6-8 weeks max is about right for all the eating as it burns out CNS after that time with heavy squats. I am currently 184lb, 5 feet 8, but would love to aim to be around Warlbergs size given enough time. And I’ve had 20+ years training myself now. Thanks. Yea, after 8 weeks it’s good to switch the workout and diet up a bit. That guy is one disgusting man-pig-unlikeable in every respect. Wow, people really don’t like this guy. At least he is going to be better than Shia LeBeouf in Transformers. There’s no question that Wahlberg used steroids. There’s also no question that he’s a greedy pig for not being up front about it, but rather, attempting to fool gullible people. Yes, I tend to agree with you. Still, he had to put in the work to get big. This is a challenging workout, and it gives you results. Even if you just stick to a clean diet, lots of protein and fibrous carbs, creatine and whey. He doesn’t take steroids!! He says he gained 40 lbs but that’s from his last movie! He sits at around 185, but for The Gambler he dropped weight but when you try to put that weight back on it is VERY EASY!! He probably gained that 20 lbs back in a week, just like how MMA fighters get ready for weigh ins!! So he actually pretty much gained 20 lbs in 7 weeks which is easily possible!! Everybody just accuses every celebrity of being on steroids! No … That is so dumb… Sorry.. You misread the article he basically gained 40 lbs in that time, not 20lb. He had to lose weight for a different movie, down from 180lb to 160lb then he had 2 months from 160 to 212.. Pay attention. This piece of writing is really a good one it assists new internet viewers, who are wishing for blogging. Why do so many people hate on the man? He’s a great actor who could easily have excelled at boxing, bodybuilding, or any sport that he dedicated himself to. Fact is, Wahlberg is the real deal. Years ago when he publicly stated that had he been on the plane on 9/11 the hijackers would have received a “beat down” from him. The majority of the public chastised him. Truth is, with some assistance Mark Wahlberg had the mental and physical capabilities to make good on that promise. I could honestly see Wahlberg putting a real hurtin on those hijackers. If I add a lot of cardiovascular 45 min steady,could this workout ad the muscle while losing the fat? Yes, especially if you do that cardio 1st thing in the morning. In the afternoon, it’s better to do HIIT cardio. More importantly, your diet is where fat loss will really come from. It’s 70-80% of body composition. To add muscle, make sure to eat protein/carbs both before/after your workout. Otherwise, stick to clean foods.